Every one of us has had a dog that seemed nearly impossible to train. We don’t like to give up, but we’re certainly not willing to let it continue either. The dog needs to be trained to use an outside alternative or we’re going to end up shampooing carpets on a regular basis. To use an alternative method such as the potty pads isn’t always practical and can be costly. 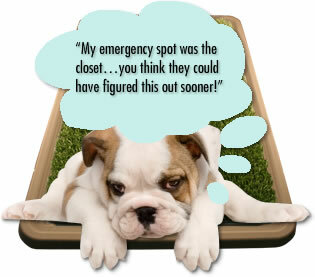 The Potty Patch was designed to use with dogs who may have trouble getting outdoors, and for those who may not readily be willing to go outdoors. Getting your dog trained right means having an alternative method of getting him or her to the right spot when they have to go and have to go fast. When you’re not home, leaving a potty patch there to assure they can find a place that is acceptable to them means that your training doesn’t go down the tubes in an instant. 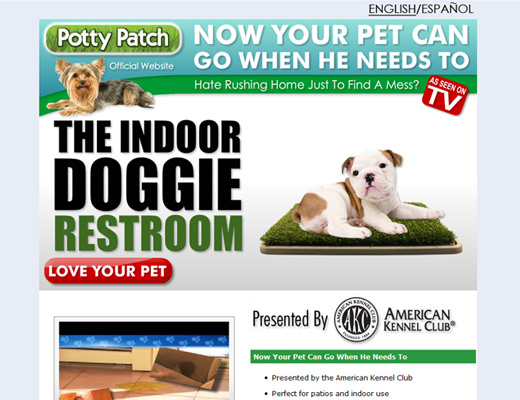 Potty patch is a unique method of keeping your carpets dry and your dog doing what he knows he’s supposed to. It is comprised of layers. The first layer, a turf type one is designed to lure in the dog making him or her want to use that particular area. The second gives them a chance to keep that layer of grass type materials dry, by letting the potty sink down through into a tray that prevents spills or a mess, keeping the grass materials dry enough to be used over and over. The washing up is far easier than you might imagine. Water and some antibacterials soaps can do wonders for it and keep the potty patch fresh. Does it work? Depends on what you want of course, but it does get your dog accustomed to going to the potty on the grass, keeping them near the door when its time to potty. Customers who have the Potty patch say it’s been a super training aid for them. If you have questions or comments on the Potty Patch, you can get them answered by calling or writing to the Potty Patch.